In a previous post, we talked about the toxic substances that may be present in lipstick. Now, let’s take a look at nail polish. In 2012, the Pollution Prevention Branch of the Department of Toxic Substances Control for the California Environmental Protection Agency released the results of a study in which several products (mostly nail color or lacquer) were tested for the presence of the toxic trio chemicals – toluene, dibutyl phthalate, and formaldehyde. The results of the study indicated that some nail polishes and other products used at salons, even those labeled toxin-free or 3-free, may contain high levels of toxic chemicals. The products (mostly nail color or lacquer) were tested for the toxic trio chemicals – toluene, dibutyl phthalate, and formaldehyde. A few years ago, most mainstream nail polish brands changed up their formulas and labeled their nail polish as “3-Free”. Some brands now label their polish as “5-free”. 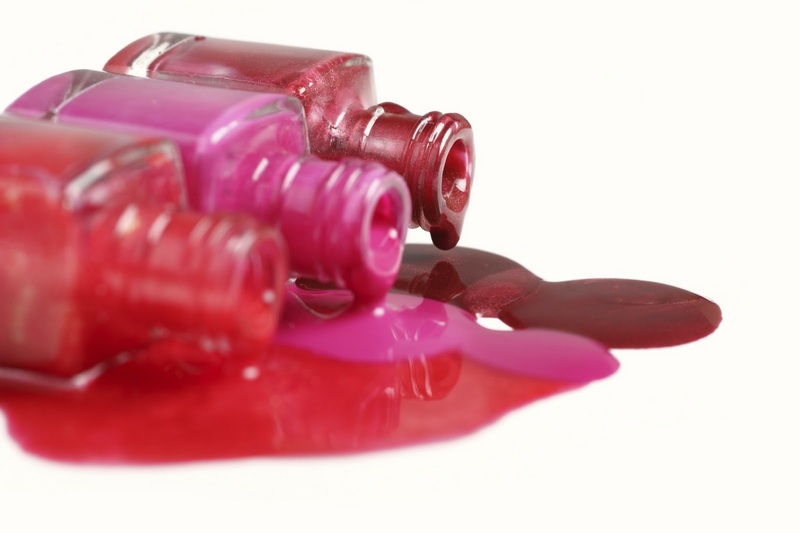 Five-free nail polish should be free of toluene, dibutyl phthalate, formaldehyde, formaldehyde resin and camphor. Notice that even the 5-free formula does not exclude butyl acetate and ethyl acetate, two of the toxic chemicals listed by MedlinePlus as poisonous and able to cause Painter Syndrome. There is something else to think about: nail polish tossed into the trash ends up in landfills and, from there, its content of toxic chemicals can reach both soil and groundwater. Be aware that nail polish is included in many household hazardous products lists and should be taken to household hazardous waste facilities for disposal. Unfortunately, compounds like butyl acetate and ethyl acetate are VOCs, or volatile organic compounds. Yet, many companies play around with the organic terms and use it to highlight it as a “positive” feature of their products. Not only are the compounds listed in the article bad, but what makes up the rest of that nail polish bottle? According to theecologist.org, another key ingredient in nail polishes is nitrocellulose, a derivative a cellulose. While the term cellulose may convince you it’s natural, think again. Nitrocellulose is a long-lasting, film-forming agent previously used in automobile paints and explosives. Like many things, it is manmade and its residues are a typical industrial pollutant found in OUR water supply and exposure can irritate the skin, eyes, and lungs. The polish’s colors is derived from a range of neurotoxic and carcinogenic compounds. While sometimes natural sources are used, such as the sparkle that mica contributes, mining such minerals is hazardous, especially to the young women and children typically doing this kind of job. The children go as deep as twenty feet below ground level in unknown areas, and many death have been reported due to collapse beneath unsteady soil. And if not harmed physically, workers exposed to mica are sure to obtain occupational diseases through inhalation, such as silicosis and bronchitis. Lastly, let’s not forget that mica, too, can contaminate water sources. For example, in Andhra Pradesh, India, a correlation between water contamination in the areas around the mica mines and a variety of health related issues such as nausea, vomiting, diarrhea and eosinophilia, silicosis and tuberculosis have been observed. Yes, nail polish smells horrendous and without a doubt is an unknown chemical concoction, but with bright colors and names like “After Hours” and “Pink Shock” (two polishes that happen to be in my own stash), unfortunately, I think this kind of cosmetic will continue to be a booming business. It is such a disappointment to see that nail polish has such poisonous inputs. As a nail polish lover, I can not believe that I have left my nail polish open around my little nieces and nephews. I had little to no knowledge about the hazards of nail polish. I have been aware that people use nail polish, and nail polish remover(acetone) to get the “high” feeling. I did some research on the 5 free polishes and discovered that Chanel, and Dior have converted to the 5 free brand (http://blog.birchbox.com/post/34572673108/is-5-free-the-new-standard-for-the-new-nail-polish). When looking for nail polish, I always looked for the color, but now I will look at the content inside the bottle. The disposal of nail polish is now a serious issue and some rules need to be placed in order for a better solution and environment. After learning so much from following this blog, I will follow these new discoveries and apply them to my life. I think the main concern, as for the majority of industries, is money. The nail polish industry is a very popular industry for teenagers and really a lot of women. If you think about it, most teenage girls use nail polish all the time. Saying this, the companies that manufacture these products know that they’re products are going to be sold regardless. Yes, some of them do advertise nail polish free of toxins but as the article stated most of the nail polishes tested still contained the dangerous toxins. I think the solution to this is a strict ban on the type of chemicals allowed when making nail polish. Not only a strict ban but actually an agency that regulates this. A lot of regulations can be put in place but if they’re not regulated theres no point. For the safety of workers and the consumers I hope this is something that happens in the near future. I knew that the fumes from nail polish were hazardous, but I was not aware of just how dangerous they were. I have never heard of Painter’s Syndrome before reading this post. This is scary because I paint my nails (typically) every few days without another thought. If I’m not completely repainting my nails, I’m often touching them up. The scariest part of this is that very few people are aware that the fumes are toxic. Similarly to you FurElise I paint my nails very often so this article took me by surprise. It is already known that fumes released from nail polish are very harmful and can have various health effects on the human body, however nothing is being done to address the situation. Perhaps companies should find chemical substitutes that can be used to achieve the same polish colors that produce less toxic fumes. Although many people including myself enjoy wearing nail polish, maybe a better option would be not to wear any at all! There are numerous natural pedicures that you can get that don’t involve the use of nail polish. Wow. I never considered that nail polish could be so hazardous. My sister and friends paint their nails every other day. Sometimes they need to match their outfits, they wore a color for too long, or just out of plain boredom. I never realized how dangerous that could be considering all the toxins in each vial. I know the nail salons have such great stench and the fumes are everywhere, I always thought I would feel dizzy. I wonder if it cause of the nail polish trapped in the room. The workers there I imagine are slowly poisoning themselves.